Borussia Dortmund’s Armenia international Henrikh Mkhitaryan may stay at his current Bundesliga side for another season in 2016-2017 despite speculation about his possible imminent move to one of leading English Premier League clubs. 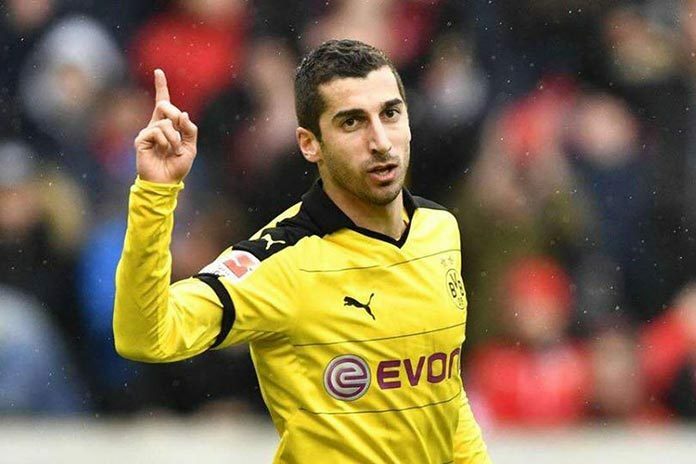 British media have recently linked the 27-year-old attacking midfielder with possible moves to Arsenal or Chelsea after what they described as a “phenomenal season” the Armenian has enjoyed in the Bundesliga. In particular, both London-based clubs reportedly sought to sign Mkhitaryan for the next season, with the Gunners ready to meet the player’s £8m-per-season (about $11.5m) contract demands, and the Blues ready to go back to their last year’s offer of £46m (about $66m) for a contract with Mkhitaryan. Other reports last week claimed Arsenal had already held talks with the player’s representatives and he had begun house hunting in London. According to the German Bild, however, the talks with the English clubs may now be derailed and both Arsenal and Chelsea may have to wait until next summer to sign the Borussia Dortmund man after the German side’s “shock decision” to keep him for one more season and allow him to leave for free next year. After losing Mats Hummels to rivals Bayern Munich and with Ilkay Gundogan reportedly moving to Manchester City, the German club is apparently not prepared to lose any more players, the UK’s Daily Express (express.co.uk) suggests, quoting from the German tabloid. Scoring 23 goals and creating a further 32 in 51 appearances for Dortmund in the 2015-2016 season, Mkhitaryan has made it into the Bundesliga and Europa League dream teams decided by media. With five goals scored in the Germany Cup, Mkhitaryan has also been recognized as the tournament’s best scorer. In 2015-2016, Borussia Dortmund finished as the runners-up in the Bundesliga, reaching the Germany Cup final in which they lost to Bayern Munich in a penalty shootout on May 21.